Anyone would regret purchasing a product that does not deliver on its promise. It would not just be waste of money but a waste of time, efforts, and a can of disappointment. This is why you should put some thought into buying from a brand that is trust worthy with years of experience providing pets with the nourishment that they need. You don’t want a sick or malnourished pet so you have to carefully select a brand that appeals to your pet and contains specific formula, built for growth and development at all stages. You are going to need a lot of information to do this. Don’t worry, we have you covered. This article gives you information on two premium brands, Taste of the Wild and Orijen. For these brands, we will discuss nutritional benefits or lack of it, product safety, brand history, ingredients, pricing and more. The concept of guaranteed analysis on pet food products is to assure purchasers of the precise nutrient content of each consumable. Emphasized by AAFCO, guaranteed analysis by food labels must meet certain requirements such as an exact value for the minimum percentage of crude protein and fat, as well as the maximum percentages of crude fiber and moisture on the basis of dry matter obtained. All of the percentages that I use in this comparison are averages of dry matter basis. Learn about dry matter basis here. Which one has more protein? Orijen outperforms Taste of the Wild with a higher protein content. The difference is significantly clear in this case as Orijen provides over 10 percent more when compared to Taste of the Wild in the dry dog food class. Similarly, Orijen thumps Taste of the Wild in the cat food category with almost 5 percent. Which of the products has more flavors? Orijen has more flavors with an aggregate of 28 flavors while Taste of the Wild has 18 flavors only. Which one has had more recalls? Both products have the same number of recalls. Like Orijen, Taste of the Wild has only been recalled only one time. Regional ingredients limits availability in some regions. The table clearly shows that Orijen has a larger product range, although the variance is not too much for comfort. 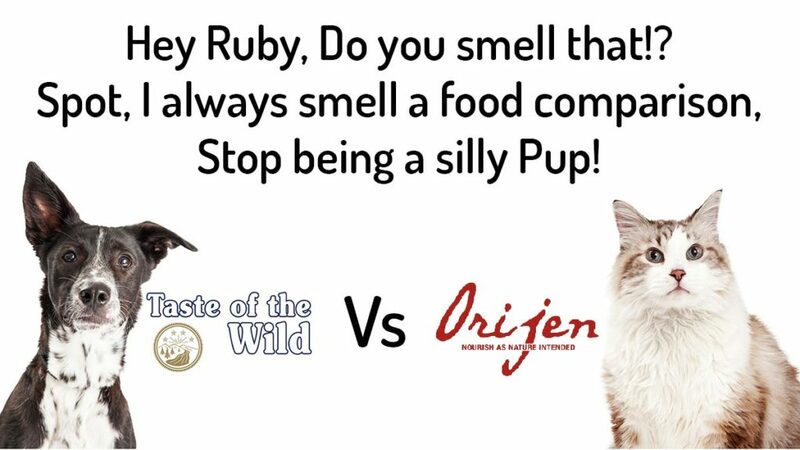 Taste of the Wild has no treats for dogs and cats and Orijen does not produce wet or canned food. Food appeals to the taste bud and gives pleasure but it does much more than that. It revitalizes the body and provides needed nutrients. In appraising the best food brand for your pet, you need to examine every brand’s nutritional value. The most important nutrients required for a balanced for a feline and canine diet are protein, fat, and fiber. With regards to dietary value, Orijen is more nutrient-packed than Taste of the Wild. It offers more value for protein, fiber, and fat altogether. You may be curious as to why these three nutrients are so important to your pet’s wellbeing. Let’s discuss them so that you can understand why it is important. Protein exists throughout your pet’s body; they will be deformed without it. It is in their bone, hair, muscles, skin, organs etc. It is not only a component of their body; it builds, repairs, maintains, and literally nourishes the body. Imagine a healthy dish that tastes bad. Your pet won’t have any of that! Fat makes food taste very appealing and appetizing. It gets even better; it is healthy and required for a balanced diet. It is a powerhouse of energy and the major source of the famous Omega-3 and Omega-6 fatty acids which helps their skin and fur glow all year round. It is great for reproduction and kidney function. Its benefits are endless when taken in the right proportion. This is your key to easy digestion. It comes mostly from the plant-based diet which is often included in recipes. Fiber absorbs water and performs a regulatory role along the digestive tract. Fiber is perfect for gut health as it helps prevent indigestion. On a long-term basis, it helps with weight management. Before you decide to pitch your tent with a brand, you need to count the cost. Budgeting is very important hence, it should be given priority. Determining the cost implication of buying a pet food tends to be chancy because of the metrics used. Prices are slated per pound and per calorie. We usually recommend that you consider the “per kilocalorie option” when drawing your budget because of the moisture content that weighs in when measuring per pound. As shown on the table, Orijen food products are not as affordable as Taste of the Wild regardless of the metric used for measurement. What flavors are available for Dog and Cat food? Taste of the Wild combines many ingredients to make diverse recipes with unique flavors. Some include Beef, Lamb, Salmon, Wild Boar, Duck, Venison, peas, garbanzo, beans, eggs, Brewers yeast, Canola Oil, Pea Protein, Tomato Pomace and more. Fish, Fresh fruit, Berries, Vegetable, Egg, Chicken, Essential vitamins, Chicken liver, Salmon, pollock, lake white fish, salmon oil, Raw whole herring, Whole pumpkin, Collard greens, red lentils, Green lentils, Pea fiber, Butternut squash, carrots, spinach greens, cranberries, blueberries, fenugreek, peppermint leaves, Whole apples, Salt, Dried kelp, Potassium chloride and more. Taste of the Wild is produced under the auspices of Diamond Pet Food, Missouri. This brand is family-owned and it has five manufacturing facilities in the US. They are in California, Missouri, Arkansas, South Carolina. Taste of the Wild gets regular supplies of raw materials from international suppliers that are span from Belgium, Germany, New Zealand, and China. As the name implies, they try to recreate meals to imitate meals that will be consumed by dogs if they were in the Wild. Their products are rich in natural ingredients. Since its operation started in 2007, it has maintained a good brand positioning in the pet food market. Orijen products are made by Champion Pet foods, Canada. Orijen has its operations in Alberta, Canada, and Kentucky. The catchphrase for their product is “Biologically Appropriate” and they have the mission to make pet food as “Mother Nature” would have intended. They are reputed to have the highest fresh meat ingredient. This multiple-award winning brand is popular for using raw, organically grown ingredients. It is their mission to dispense sophisticated and nourishing meals that would pass as good enough for human consumption. Orijen has been in the market for over 30 years and their products have maintained that premium standard across all formulas. Companies make scheduled recalls on products that may have a foreseen defect or safety issues. The importance of a recall is to conduct further safety tests in order to effect changes to product to ensure that it is safe for use. Orijen was also recalled once: Nov 22nd, 2008 – Irradiation treatment consequences. Both brands are exceptional in their unique ways but we have to declare Orijen the winner. Orijen is an award-winning brand that has remained relevant over the years. Although it is quite high-priced, the greatest merit for this brand is its rich nutritional composition.